It also has a base rotation of 270 degrees, base motion of 180 degrees, vertical reach of 15 inches, horizontal reach of 12.6 inches, and lifting capacity of 100g. Impressive! Added features include a search light design on the gripper and a safety gear audible indicator is included. 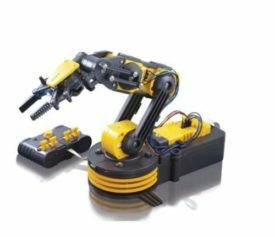 Award winning Robotic Arm Trainer, OWI has made robotic arm technology more affordable without compromising quality.